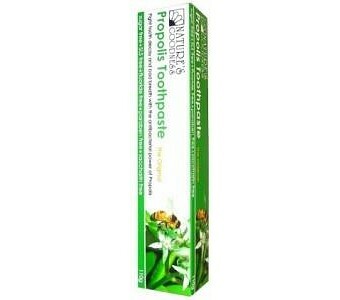 Nature’s Goodness Australia Propolis toothpaste is a unique formula to freshen your breath and to help protect against plaque and gum disease. Propolis is a natural substance produced by the honey bee composed of organic acids, flavanoids, minerals and other essential elements. Propolis Toothpaste also utilises the power of Xylitol, a natural sweetener substance from the birch tree. Xylitol fights acid-producing bacteria which cause tooth decay and gum disease. Sugar Free Paraben Free Fluoride Free SLS Free Saccharin Free Propolis assists with healing many infections and health problems such as colds and flu, ulcers, and gum disease. Ingredients: Each 100g contains: Calcium Hydrogen Phosphate, Water, Sorbitol, Glycerin, Silicon Dioxide, Xylitol, Lauryl Glucoside, Hydrogenated Caster Oil, vegetable gum, Propolis extract, Citric acid, Potassium sorbate, Peppermint Oil, Aniseed Oil, Sage Extract, Chamomile Extract, Clove Bud Oil. Warning: Propolis may cause allergic reactions. Test before use.